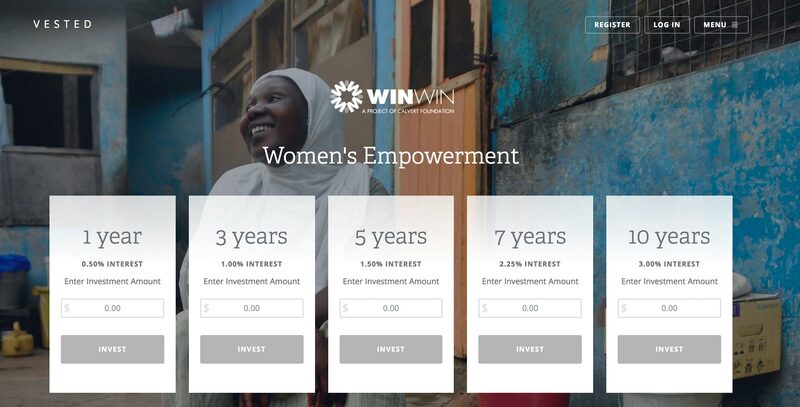 An online portal designed & developed to facilitate citizen-powered social impact investing. Vested.org, powered by the Calvert Foundation, is an online platform where individuals can invest as little as $20 in the causes and places that matter to them. The Calvert Foundation partnered with Intridea to create the entire experience: from design, to workflow, to engineering. Launched in June 2014 at the Clinton Global Initiative, Vested.org powers the “Ours to Own” campaign which combines the collective power of individual small investments to support local communities. Investing is no easy process, and Intridea was tasked with solving the innate UX challenges that come with bank transfers, communicating with users of varied technical proficiency, as well as designing a site that’s friendly, simple and straight-forward. 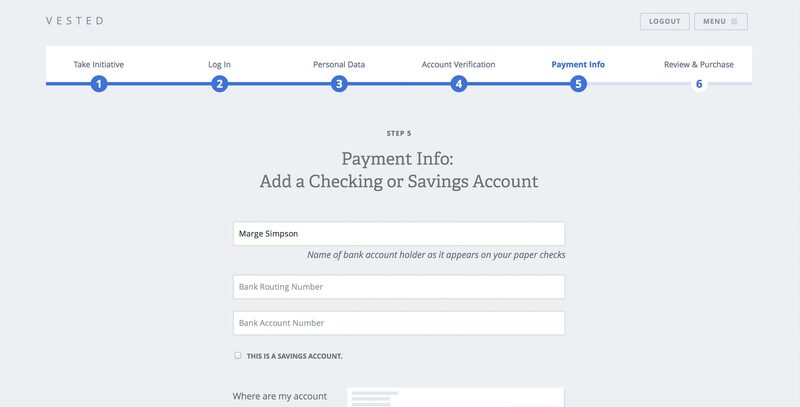 From start to finish, from desktop to mobile (and all viewports in-between), Vested’s Payment Process Flow is smart and easy to understand. Transferring money from multiple bank accounts is a complex process. The sensitive nature of personal fund handling is made easy and comfortable for the user with Vested.org. Whether you prefer investing via phone or from your desk—the payment flow is consistent, easy, and smooth on any device. The intuitive investment experience masks a complex backend. Vested.org’s investment flow uses multiple account types (savings and checking) and ACH transactions; each transaction type happens on a different timeline. Using the Bancbox API, Intridea built the backend that verifies investor identity, facilitates these transactions, and tracks investments as they mature. Every user creation, purchase, disbursement, and interest payment is also updated on Salesforce via the API. 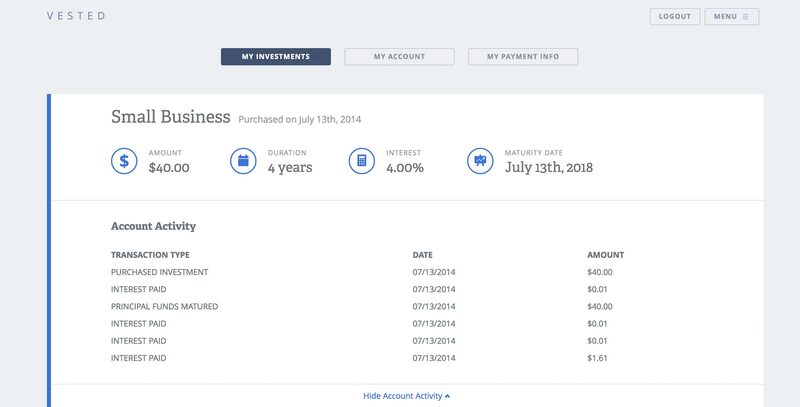 Vested.org investments can be tracked in real time via the Salesforce dashboard, equipping Calvert Foundation with real time reporting and a flexible dashboard for tracking metrics. Vested’s main content are Initiatives that focus on issue areas such as affordable housing, education, environmental protection, fair trade, financial inclusion, healthy communities, job creation, and women’s empowerment. It was important for Calvert Foundation to be able to grow the site as their initiatives grew, as well as customize the imagery and copy for each initiative. Providing a custom Content Management System (CMS) interface allows Calvert Foundation to adjust initiatives as needed, while still keeping the same layout for consistency. The user can watch their investments mature, with regular updates as to the activity of their investment. What happens after you invest? We solved that with an investments page that allows users to watch their investments grow. From viewing the details of your investment to managing your payment and personal information; the investments page does it all. Users are notified when any action is required and once an investment matures, the user is able to cash out or reinvest. Keeping the user informed was a top priority and Vested.org’s investments page is the perfect platform for the job. Copyright © 2019 INTRIDEA Inc. All rights reserved.